Sept. 8, 2015, 2:25 p.m.
By Shan Wang @shansquared Sept. 8, 2015, 2:25 p.m. The New York Times, troubled (but possibly reforming?) 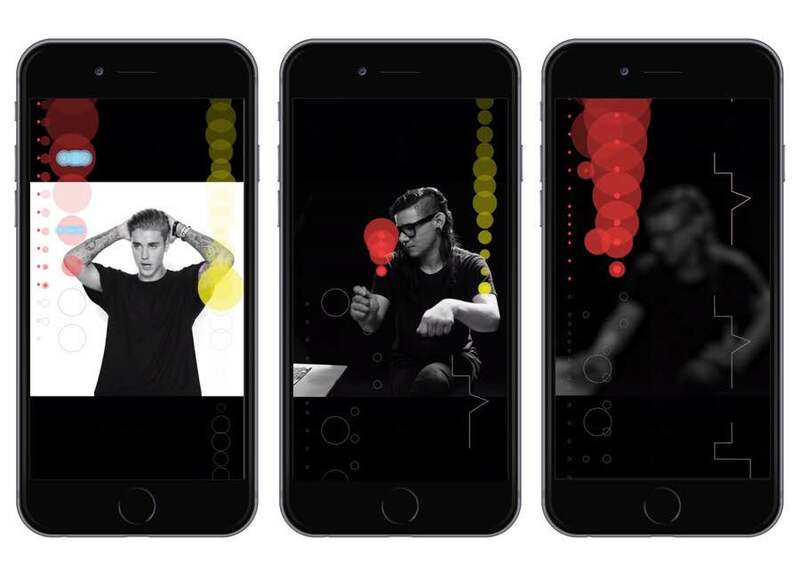 megastar Justin Bieber, electronic music producer Skrillex, and DJ/impresario Diplo recently became unlikely collaborators in a recent video feature about the making of the hit song “Where Are Ü Now.” The eight-minute video, which accompanies a 1,600-word piece by Jon Pareles, features interviews with the three artists explaining how the various sounds in the song were created and later pieced together. As the song itself plays in the background, visualizations in the form of colorful geometric shapes and lines run down the left and right sides of the screen, pulsing to the beat of the song. Take a few minutes and watch the actual video at the Times. If you have time, watch it on both your phone and your desktop. Unsurprisingly, the combination of Bieber and The Grey Lady turned some heads. But the Times’ video is interesting for another reason — it was designed from the beginning to be as compelling viewed vertically as horizontally. In a world where young people are watching more video on smartphones than on TV screens, making a video work in both aspect ratios can help it reach a broader audience. The traditional way to visualize music is horizontally — think of a sound wave, or the way sheet music is read — but in this case, the decision to animate the video’s graphics vertically was a practical one as well as a stylistic one, according to Roberts and Alicia DeSantis, another graphics editor who worked on the video. “The more verticality you had in the video, the more benefit you could get out of the graphics,” Roberts said, pointing out that with this design, people watching the shapes change as they moved up the screen would actually be able to see more of the shapes’ progression. But adjust your browser size, or switch to viewing on a tablet, and the graphic overlays still don’t impede the musician’s faces. (On the full screen version, the graphics move behind the figures.) That’s because there were three different versions of the video, according to Roberts: 16:9 ratio for the Times online video player and for YouTube, 3:4 which worked for iPad, and 9:16 for vertical view on mobile. The team then shot the videos with multiple cameras in black and white and in 6K resolution (“Let’s go show this at the IMAX!” Roberts joked to me) to allow for maximum flexibility when it came to post-production cropping, leaving plenty of extra space around the talking heads. Editing was done using Premiere and After Effects. The team also used Logic to get a sense of song patterns. DeSantis pieced together footage in an old-fashioned way: by printing out transcripts of the interview, color-coding each artist, cutting out specific quotes, and moving the strips of paper around until the story made sense. The first cut, she said, was about 25 minutes long. When Roberts first began to map out sections of “Where Are Ü Now” by hand to try to come up with the precise graphics to lay on top of the video, he realized “there were really only a few distinct parts, and a lot of it was loops,” making it possible to present something visually interesting that wasn’t overcomplicated. Since the video was conceived as a way to lift the veil on how this summer hit was made, the graphics team wanted to be sure Diplo and Skrillex brought their instruments (i.e., their laptops) to the interviews for on-the-spot demonstrations. For the distinct pieces in the song, the musicians played a stem, the technical term for a single, separated out track. Roberts created separate graphics layers to represent these stems: a layer for all the drums, the piano, and so forth. The much puzzled-over “dolphin flute sound” (represented visually by the lines with a peak), was revealed to be Bieber’s voice, electronically distorted. POSTED Sept. 8, 2015, 2:25 p.m.
Wang, Shan. "The New York Times wrestled with many dimensions of video to visualize the making of a hit." Nieman Journalism Lab. Nieman Foundation for Journalism at Harvard, 8 Sep. 2015. Web. 25 Apr. 2019. Wang, Shan. "The New York Times wrestled with many dimensions of video to visualize the making of a hit." Nieman Journalism Lab. Last modified September 8, 2015. Accessed April 25, 2019. https://www.niemanlab.org/2015/09/the-new-york-times-wrestled-with-many-dimensions-of-video-to-visualize-the-making-of-a-hit/.